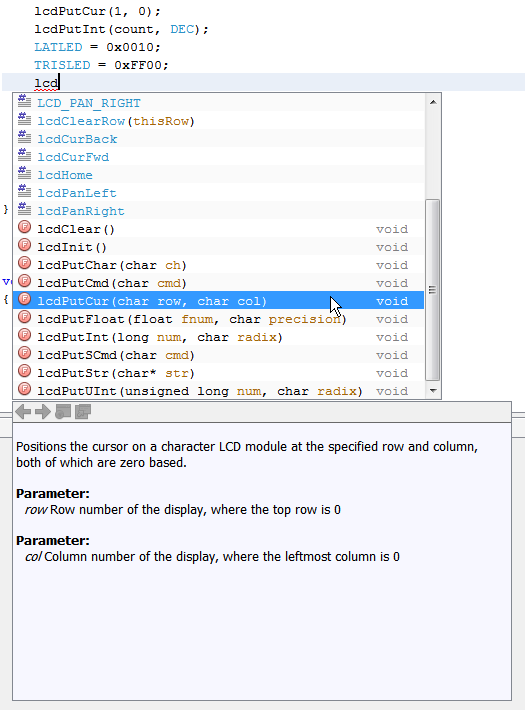 The Code Assistance window can display documentation for the selected identifier. To create documentation for a function, you need to add a Javadoc comment block immediately above the function prototype (or definition if available) that starts with '/**' on the first line. The editor can assist you by auto-populating a basic Javadoc comment block. The editor will automatically add a skeleton for the documentation similar to the one shown below (if documenting a function). On the first line with a '*', you can type in a description the function. The @param lines were added automatically based on the parameter list of the function prototype immediately below. You can add comments after each parameter on the same line and they will also appear in the documentation window. The documentation shown in the image above was generated by the following comments immediately above the lcdPutCur function declaration. * Positions the cursor on a character LCD module at the specified row and column, both of which are zero based. * @param row    Row number of the display, where the top row is 0. * @param column    Column number of the display, where the leftmost column is 0. Javadoc formatted comments can be considerably more complex. Comments may be formatted as HTML which can then be used to generate documentation in the form of web pages. For more details on the syntax and capabilities of this feature, please see the Oracle web site's page on the topic.